A dense, perennial flowering plant, that has aromatic, finely cut leaves and clusters of small daisy-like flowers in summer. A tea made from the leaves may relieve migraines and indigestion. Companion plant near fruit trees. Attract bees. Perennial. H:60cm W:30cm. 12cm, 17cm. • ± 1m; Spread: ±50 cm. • Attracting Beneficial insects: Bees and is often planted near fruit trees to assist pollination. • Flowers add colour to potpourri. • Blood thinner (anti-coagulant), Protects against clot formation. • Painful, absent or irregular menstruation. • It may also help ease diseases caused by chronic inflammation, such as arthritis. • 1 or 2 large, or 3 or 4 small leaves, every day until positive results achieved. Can also be eaten with bread in a sandwich or in mashed banana. • 5-20 drops every 2 hours for acute conditions. Three times daily for chronic. 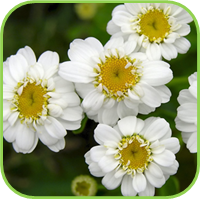 • Taken as recommended, standardized feverfew causes minimal side effects. Minor side effects may include gastrointestinal upset and nervousness. 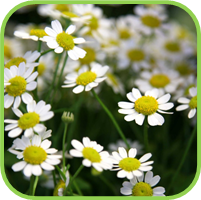 Chewing feverfew leaves has been known to cause mouth ulcers. 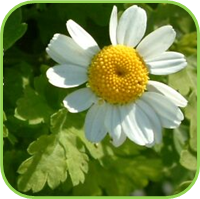 • Feverfew is not recommended during pregnancy or lactation, and should not be used by children under the age of two years. Also not used when taking the contraceprive pill. • Do not use with other blood thinning medication like Warfarin.